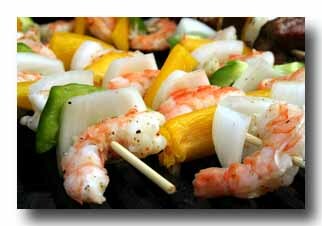 Some of my favorite recipes are Grilled Shrimp Kabobs. They are easy recipes, fun to make and kids love them. They also make a great party appetizers or a main course. ...select the right size shrimp. My recommendation is to use large or extra large shrimp. The larger sized shrimp stay on the skewer better. They are also large enough to thread the skewer through two spots on the shrimp holding them more securely on. ...if using wooden skewers, soak the wooden skewers for approx. 1 hour prior to using them on the grill. This prevents them from burning. Find a large enough pan to fit them into and cover them with water. You can place something on them to hold them down in the water or swish them around several times during the soak. Also, when skewering the shrimp, leave plenty of room on the end of each skewer to be able to grab them. This also prevents the shrimp from falling off the ends when you flip them. A good rule of thumb is to leave approx. 1-1/2" on the ends. The absolute best skewers you can use, however, are Double Kabob Metal SkewersDouble skewers hold all of the food in place without it turning on the skewer as you are grilling. Also keeps the food from falling off. They are great! ...the grilling temperature. A medium to high heat usually works best when you grill shrimp. And the last and most important tip when making Shrimp Kabobs is always watch the amount of time you cook it. You do not want to over cook the shrimp. When shrimp is overcooked it gets tough and rubbery. So, that’s all there is to it. 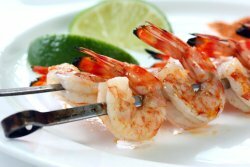 Fire up your grill and try a recipe for Shrimp Kabobs today! BBQ Bacon Shrimp Skewers - Fast and Easy! Spicy BBQ Shrimp - These are kicked up a notch! Hawaiian Grilled Coconut Shrimp- This is one of the best grilled coconut shrimp recipes! Shrimp Rice Kabobs- This is an all-in-one dish! 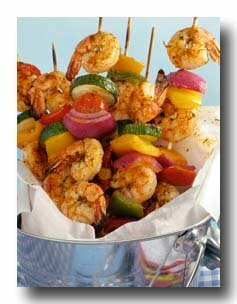 Cajun Grilled Shrimp Kabobs This recipe is for marinated grilled shrimp. "The double skewers are the best to use because the food does not spin on the skewer. It holds nicely in place and makes them easier to flip on the grill. I also LOVE, LOVE, LOVE...the beachy design on these. They are perfect for entertaining!" Two prongs secure food to prevent spinning. Finely detailed coastal icons include crab, lobster, scallop and fish.